Terrific performance in normal shooting modes; Unequalled performance when using Fast Autofocus Live View; Very comfortable body size and weight; Great ergonomics; Pleasing control layout; Unique Auto HDR (High Dynamic Range); Class leading frame rate (up to 7fps using "Speed Priority" and up to 5fps with Autofocus between frames); Dual Card slots (SDHC, MS Pro Duo); Superb 3-inch tilting LCD with 922,000 pixels; Excellent battery life; All lenses enjoy the benefits of a Super SteadyShot body based image stabilization system. No way to turn off high ISO Noise Reduction (Normal or High options only); No video capture feature; No standard video out (mini-HDMI Port only); No included video cable (an HDMI cable is optional); No Depth of Field Preview or Mirror Lockup features; Slightly slower than maximum frame rate when using AF-C (Continuous AF) in some conditions (although the A550's frame rate is still outstanding for cameras in this price range). Sony has created yet another pleasing dSLR model that is likely to appeal to many photographers looking for a unique camera with the ability to perform well in a various shooting conditions. We were very impressed with the A550's abilities during our testing, especially when you consider the price point of this model, and have little doubt that the A550 will appeal to a wide variety of photographers (from the most experienced professionals, as well as photographers looking for their first dSLR). Read Steve's Conclusion to see our complete thoughts on the A500. 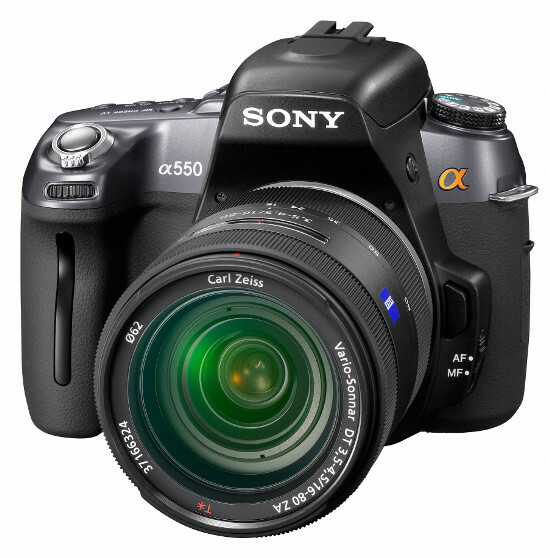 The Sony DSLR A550 is Sony's second model we've seen to hold a spot in their mid-level dSLR line of cameras. The A550 and A500 are very similar in features, with the A550 offering increased resolution at 14.2 Megapixles of resolution, and 921,600 pixels packed into the 3-inch tilting LCD, along with the A550's increased burst ratings up to 7fps. This model also has the new Exmor CMOS imaging sensor and Sony's fast BIONZ image processor to improve the ease of shooting and get clearer images. Like its sibling, the A550 uses Memory Stick Pro Duo, SD and SDHC memory cards and is also compatible with Son's new 32GB Memory Stick PRO-Duo HX card. The DSLR-A550 is available in several different ways, you can purchase just the camera body (DSLR-A550 MSRP$949.99) or a body and lens kit like we tested. The kit configuration includes the SAL1855 SAM DT Lens (DSLR-A550L MSRP $1049.99). Below you will find the original Sony Press release.